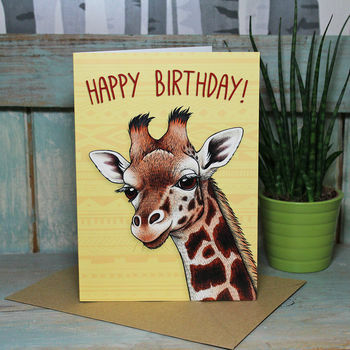 This cute greeting card features my Rothschild's giraffe illustration. This would be a great birthday card for any wildlife lover! It is left blank inside for your own message. I began this illustration by sketching out the giraffe in pencil, adding detail and shading. I then scanned my drawing in and added colour digitally for a really bright and colourful finish! All my cards are printed in the UK on FSC certified card and come with a brown flecked envelope made from recycled papers. Cards posted within the UK will not be sent in a cello bag as part of the Naked Cards campaign to cut down on plastic and packaging (read more and get involved here: www.nakedcards.co.uk). International orders will be sent sealed in a biodegradable sleeve, but if you'd still prefer to go without please let me know in a note with your order. FSC certified 280gsm smooth white card and recycled envelope. This product is dispatched to you by Lyndsey Green Illustration.